Enjoy the fresh air at an altitude of 4000 meters! If you take the cable cart “Teleferiqo” in the morning from 9 am you will most likely get an amazing view of the whole city, including several volcanoes. 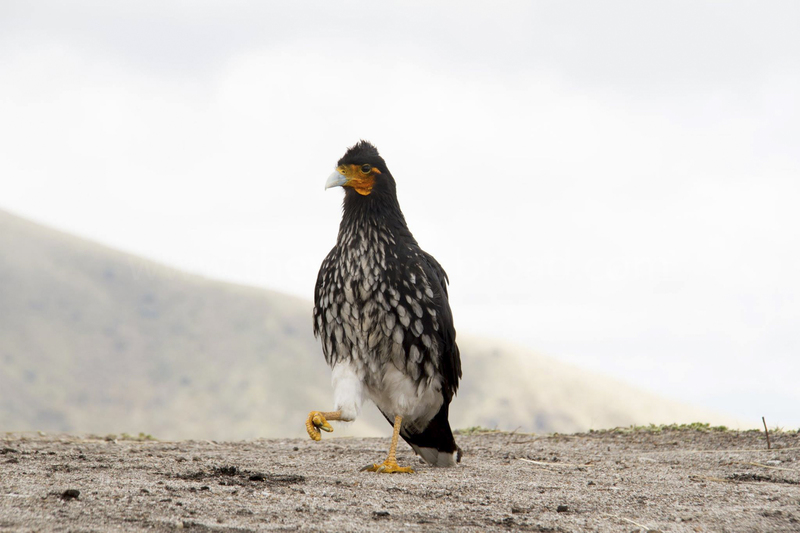 You can do the hike up to the volcano Ruco Pichincha of an altitude of almost 4700 meters. Don’t walk without a guide, you can get lost! Don’t forget to dress for the hike, you need good shoes, warm clothes, sunglasses and don’t forget to you cover yourself with sunscreen. The sun is incredibly strong in the middle of the world. Entry is $8 to take the cable cart. You also need to bring a valid ID. Quick tip: Hold on to your ticket while you are up there. You will need it to get on the cart back down. If you are lucky you will be able to spot beautiful wildlife like the bird Curiquingue. 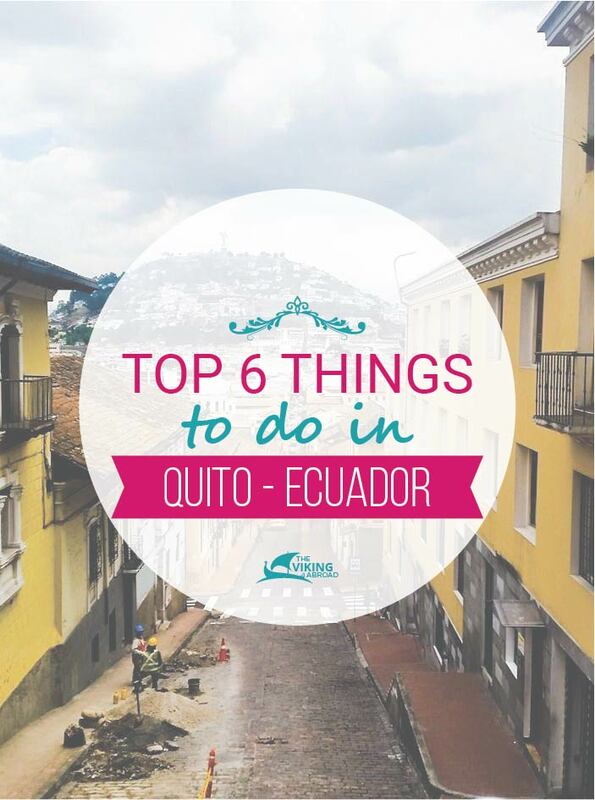 Experience outstanding Colonial churches, museums and monuments in the Old Town in Quito. Most of the places are within a walking distance. You can start with La Basílica del Voto Nacional, where you can climb to the top and enjoy the beautiful Basílica and the view of the rest of the old town. Entry for the churches in Old Town may vary from $0 to $5. A short 10-minute walking distance from Basílica you can see Carondelet Palace (the Presidential Palace) and if you go there on a Monday morning 11 am you can see the change of guards. Close to the Palace is the most magnificent church you will see in Quito; Iglesia la Compañia de Jesus. The Church has a very interesting history and is made out of volcanic stone. 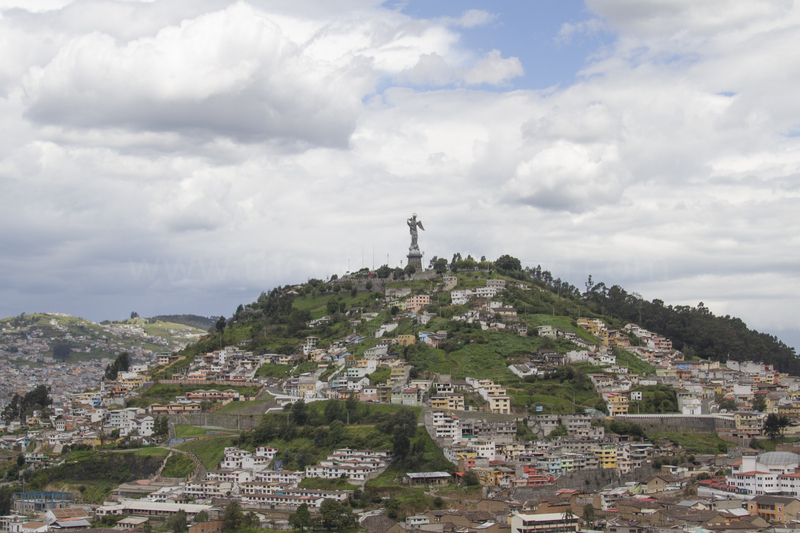 If you look south you will see the Virgen del Panecillo, it is upon a hill which you can even walk to or get by taxi. The same day you can visit the picturesque area in the old town called La Ronda. La Ronda is safe and has many cosy cafes and restaurants. If you are lucky, you might see a traditional show. 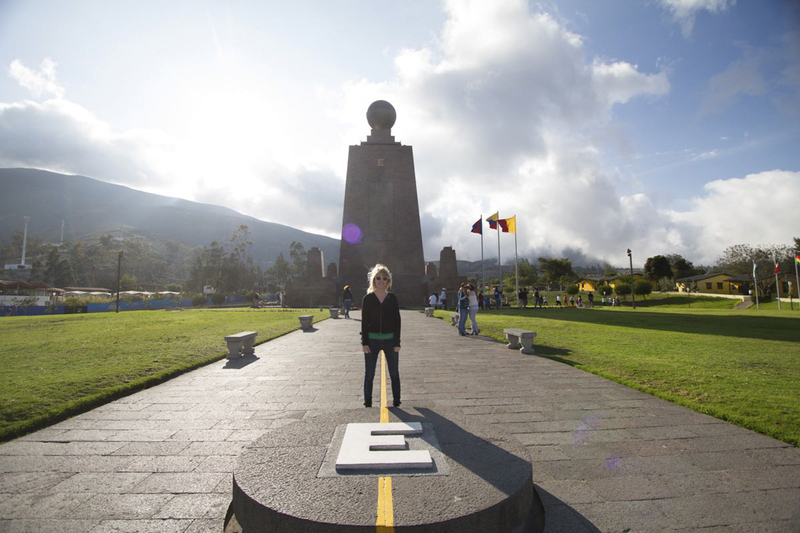 You simply haven’t been to Quito if you haven’t stood with one foot on the northern hemisphere and the other on the south hemisphere. About 45 minutes north of the city centre is the Middle of the world monument (Mitad Del Mundo). Entry to the monument is $3. Around the monument you can find small souvenir shops, traditional food and two lamas you can take selfies with! If you are there on a weekend it is traditional shows. Looking for colourful souvenirs? Mercado Artesanal is the place! 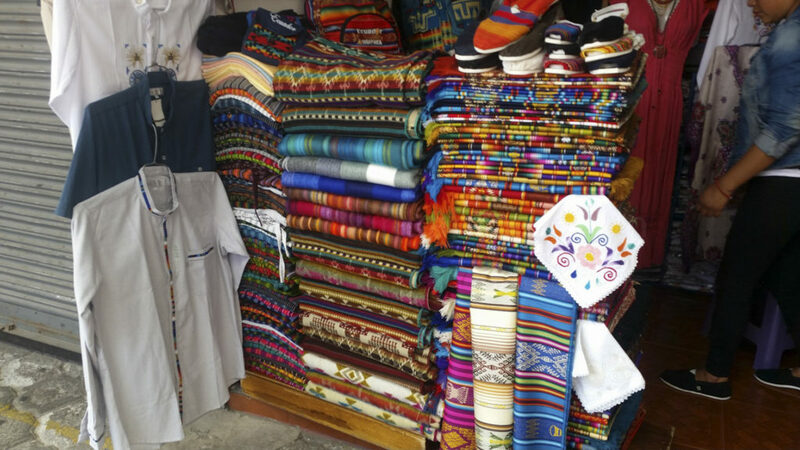 If you don’t have extra time to visit the huge handcraft market in Otavalo, Mercado Artesanal is the best alternative. Mercado Artesanal is placed in La Mariscal area. 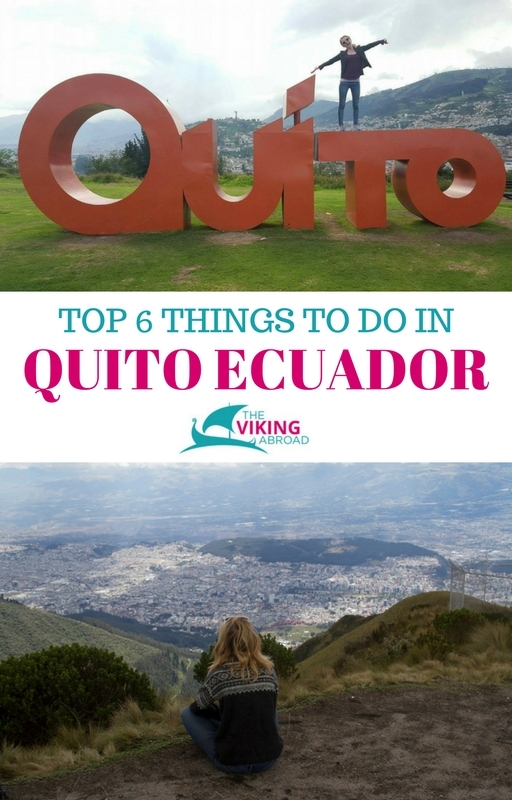 It is a cheaper alternative than Otavalo. Here you get a chance use your haggling skills. You can get some really good and unique deals, everything from colourful shoes, bags, scarfs and jewellery. La Carolina is the most lively place you can be on a Sunday. Families, musicians and sports enthusiasts enjoy everything this park has to give for free. 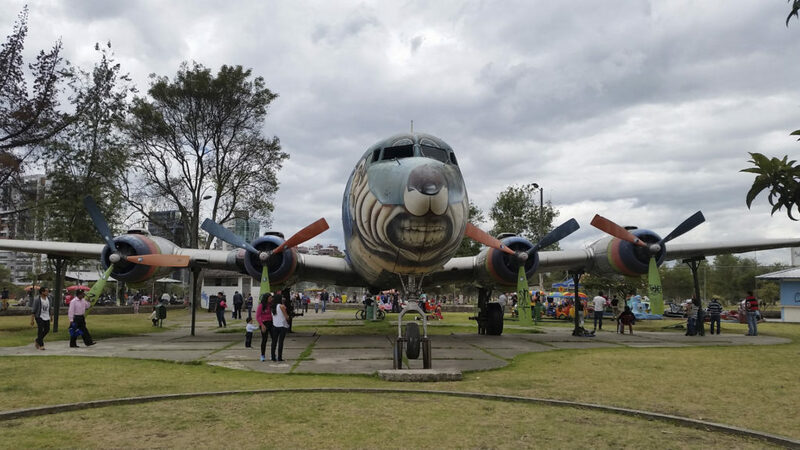 You can see lots of food stands, playgrounds and even an abandoned aeroplane! If you are not able to be there on a Sunday, any day is good as well. La Carolina was renovated I the beginning of 2016 and is very safe to walk around even late at night. This beautiful café is placed in the Old Town and is known for its beautiful view of Panecillo. If you are travelling with your pet, feel free to bring it! They can get their own meal. 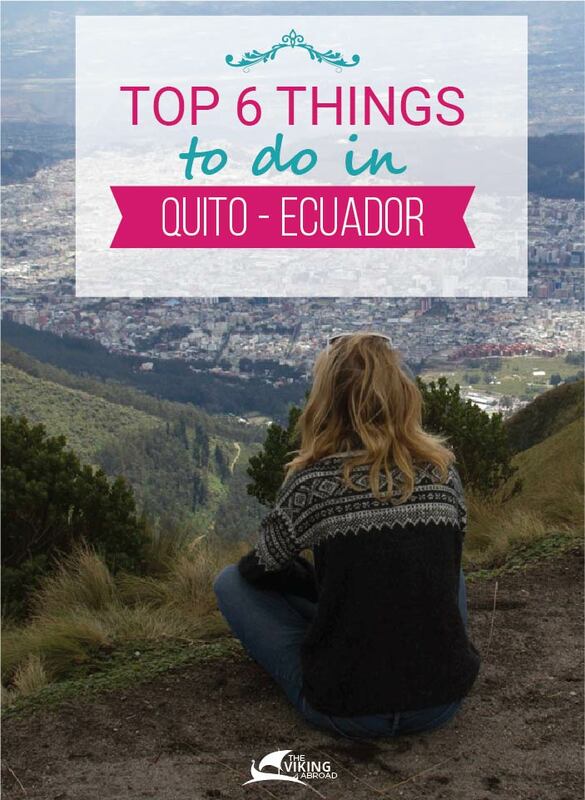 Have you been to Quito, Ecuador? 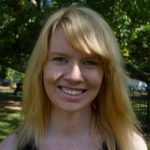 Is it anything you missed from this article? Write a comment below. I knew someone who came here recently, the architecture and the fabric colors always throw me off! So lovely. Wow! You were literally at the middle of the world! These are gorgeous pics. Thanks for sharing these great tips to enjoy this beautiful city! Thank you so much! .Yes, it is kind of different for me to live here, because the weather is the same all year around. No winter no summer xD . That seems like an absolutely amazing place to visit! I’d love to go for a hike there one day! Hey you posted that awesome featured image of you at Itchimbia but left it off the list! 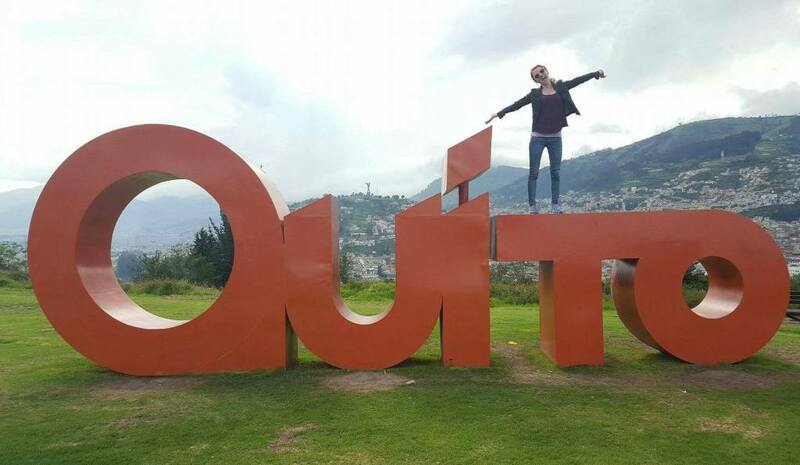 That’s my favorite park in Quito. I’m actually back in Quito right now and I live between Parque Carolina y Parque Metropolitan but I still hike to Itchimbia about once a week for the amazing view. Overall good list! I definitely recommend hiking up to El Panecillo. (Don’t take a taxi, earn the view!) Ciudad Mitad del Mundo wasn’t as satisfying as I hoped, especially after discovering that it’s not ACTUALLY built on the equator line, but it was a fun day with friends.. I love this city. I rarely come back anywhere (there’s a lot of world to see) but Quito holds a special place in my heart.